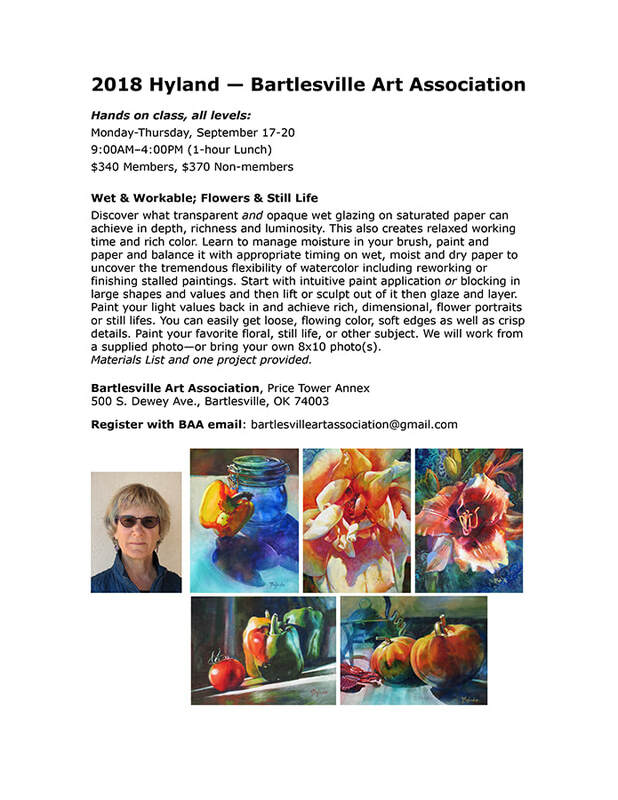 "Where Abstract Art Lives In Los Ranchos"
Studio J offers painting classes for experienced artists and beginners alike. Instructor Janet Bothne custom tailors each class to best address each student's goals, skill levels and encourages them to find their own individual style. Abstract Painting classes in acrylics and other water media are ongoing at Studio J. "Intro To Abstract" classes happen on the 3rd Saturday morning of each month and "Intermediate Abstract" classes meet once a week on either Tuesdays or Wednesdays and students can enroll on a month to month basis. Class duration is 3 hours and costs $25 per class. ​ Workshops are scheduled intermittently addressing a variety of subjects. See the EVENTS page for information on upcoming workshops.We also host "Paint Parties" for non-artists looking for a fun night out to explore their creativity with friends in a relaxed atmosphere. Paint nights can be booked off-site as well, for groups of 10 or more. Join Ming Franz in the beautiful countryside of the Dordogne region of France, September 20-29 2019. All inclusive accommodation, daily excursions and painting lessons. Just add your flights. Limited availability for this exclusive trip. Prices start at 2550 Euros (approx. 2900 US Dollars). Ming specializes in Chinese brush painting, western watercolor and splashed ink painting, which combines watercolor techniques and Chinese brush. She received her basic art training in Taiwan and has continued her art in the U.S. She teaches workshops throughout Albuquerque. She also teaches annually at Artist's Expo in Houston, TX, Silicon Valley Asian Art Center, CA and many other art organizations in New Mexico and California. 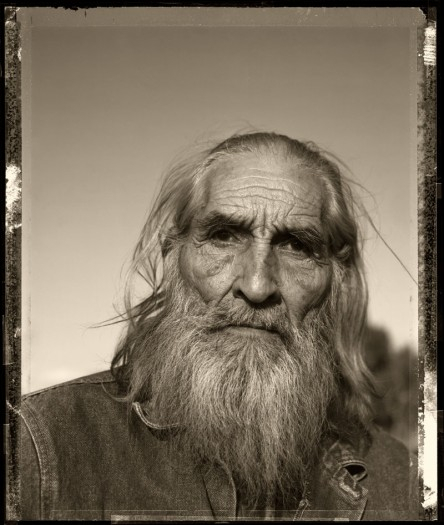 A little about the Taos workshops. Magical, physical and totally satisfying. I lived in Taos for 14 years and I know 'the painting spots'. I like to schedule a working artist studio visit, we will go to a studio/home of a working artist, meet them and paint in their place or gardens. The workshop is designed to show you the possibilities! Incredible scenery, the mountains sit just right, the atmosphere is clear and the charm and ambiance of the town of Taos is incomparable. Canyons, mountains, rivers and adobes, it's all there. 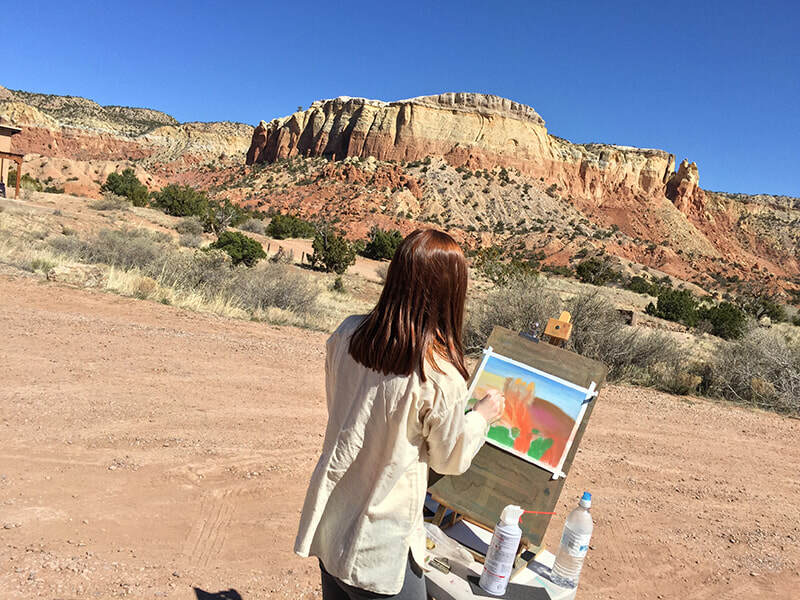 This is your time away to paint in a place you will never forget. If you have questions or concerns about lodging I can help you with that. Oh and the NEW Mexican food... did I mention that?! 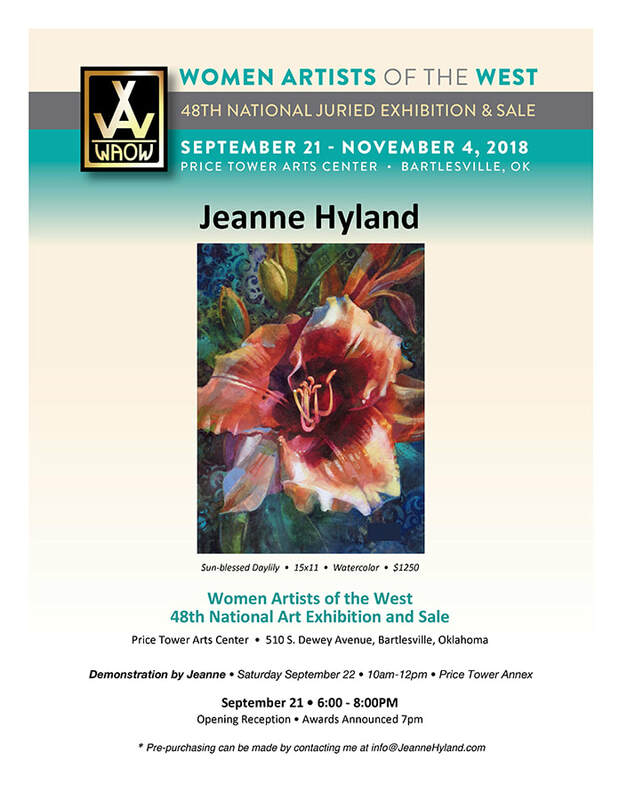 Jeanne offers watercolor art original paintings as well as instruction in Santa Fe, New Mexico and other locations nationally. She is passionate about character portraits, flowers and still life subjects. 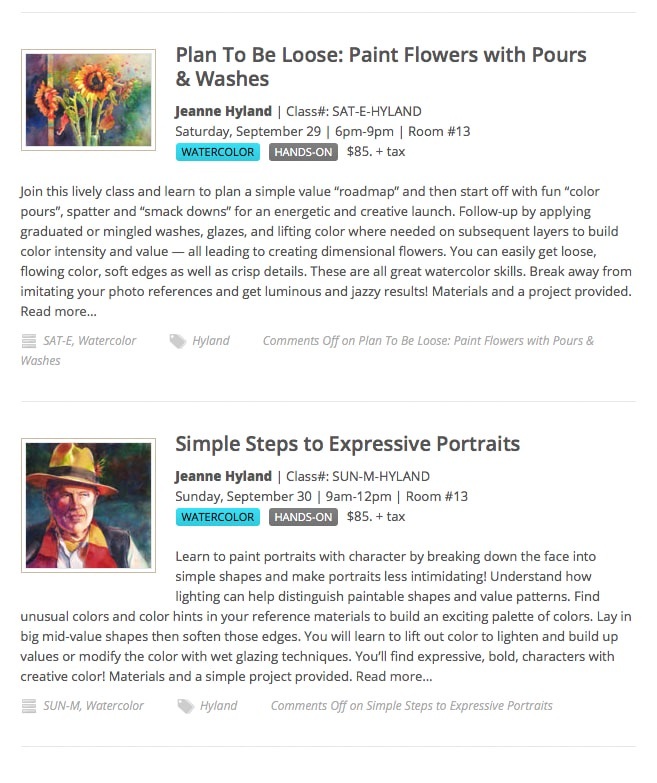 Jeanne has developed a unique approach to working in watercolor that she calls "Wet and Workable" and offers workshops, classes and personal instruction in this and other watermedia processes. ​Jeanne holds a BFA degree from UNH in figurative sculpture and studied at Ecole des Beaux Arts, France. Commercial design in Colorado preceded a return to fine art participating in Loveland Sculpture Invitational and Sedona Sculpture Walk. Jeanne adopted watercolor after moving to California where she instructed at the Los Angeles Academy of Figurative Art, Learning and Product Expo and Brand Library Studios. 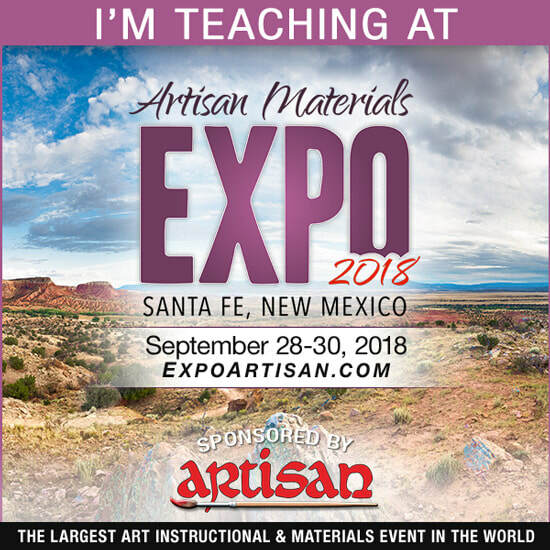 Jeanne teaches in Santa Fe, Artisan's ART Expo and other locations nationally. 1-3 people, 1-3 days, a really great way to get your questions answered, on dates that work for you. ​Ojo Caliente an hour north of Santa Fe. unlimited variety of settings to focus your work. Students can bring their choice of mediums and Sheila will have a trove of materials including easels for use. ​color theory, "seeing", breaking down a place into abstraction or individual expression, and honing in on intent. My teaching style is grounded in many years of making art and teaching. I am flexible and responsive to the interests, needs and experience of the class participants. And I think the classes should be fun! Shoenfeld's love of nature underlies all of her painting. 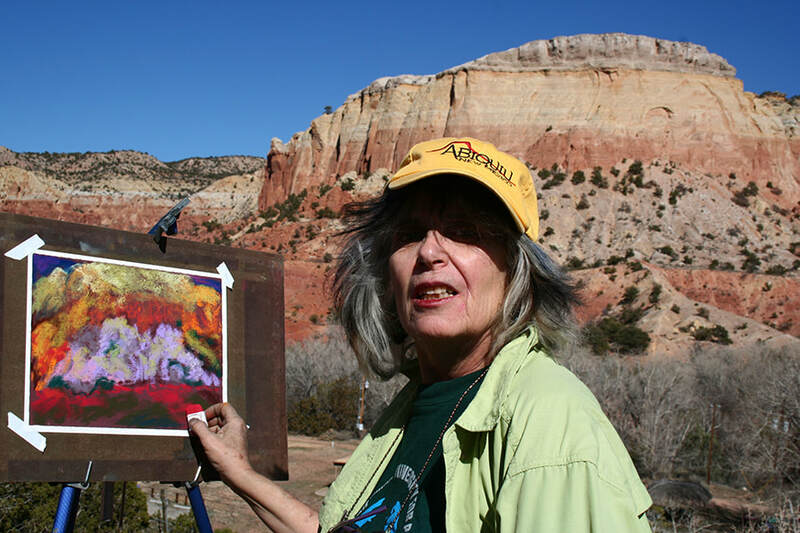 This video includes her large studio abstractions, vivid plein air pastels, and a new series of paintings in response to poetry about global climate change and species demise, The film beautifully weaves short recordings of poetry, shots of the artist in her Santa Fe Studio, and superimposed images of the actual landscape. 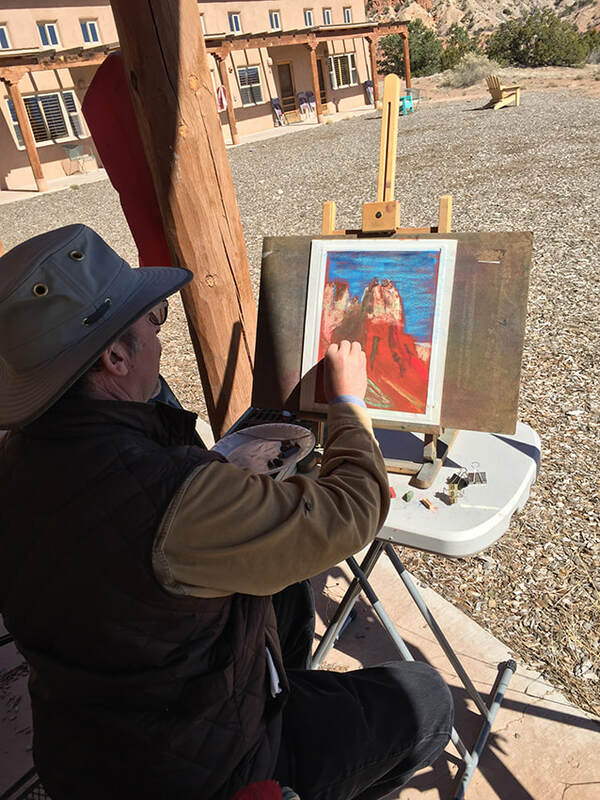 Jane's Art Classes and Workshops focus on the beauty of the Southwest landscape from canyonsunsets to adobe architecture. ​Art and Creativity workshops for meetings and seminars can be arranged. ﻿Swan Studios has been honored to host many skilled ceramic artists. 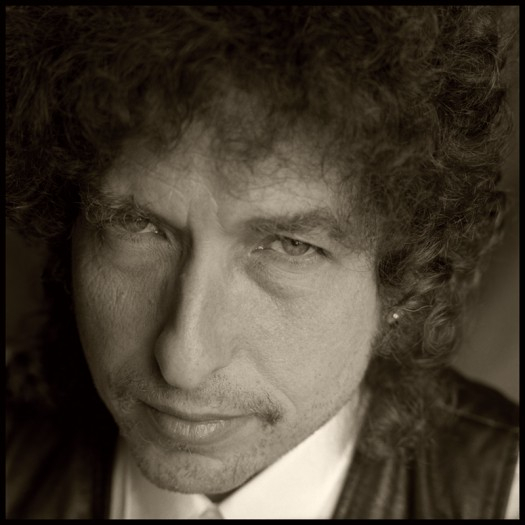 Some of the artists are nationally and internationally known. Others are relatively unknown in the ceramic field. They all offer interesting and innovative techniques in both sculpture and functional ceramics. Swan Studios is located near Lincoln, NM in the beautiful foothills of the Capitan Mountains. At the workshops students spend a few days learning and working on new techniques while they enjoy the lovely countryside. The Wortley Hotel, Ellis Store, and Lincoln Works have accommodations available. "A Beggar had been sitting by the side of the road for over 30 years. When a stranger walked by, “spare some change?” the beggar asked holding up his old baseball cap. I have nothing to give you the stranger replied. Then the stranger asked “what are you sitting on?” “Nothing” replied the beggar “just an old box that I’ve been sitting on for as long as I can remember”. “Ever look inside?” asked the stranger. “No” said the beggar “what’s the point? There is nothing inside” insisted the beggar. “Have a look inside” insisted the stranger. The beggar managed to pry open the lid with astonishment, disbelief and elation he saw the box was full of gold. I am that stranger who has nothing to give you and is telling you to look inside, not inside any box but somewhere even closer inside yourself." ﻿TDLT is a non-profit project of Espanola Fiber Arts Center. TDLT offers individual and small group classes in weaving, dyeing, felting, and other fiber arts. We meet the second Friday of the month at 11:00am during summer months. Fine Art Paintings Illustrations–member of PSNM, WCSNM & RGAA.